In a few hours, Apple will launch the iPhone 7. It’s an event that many of us, both from the journalistic side of the fence, and those who merely have an enthusiasm for Apple products, have been waiting for. There have been so many rumors that seem incredibly plausible, I’m not sure there’s going to be any surprises. I don’t want to add any more fuel to the flames of speculation – god knows I’ve done that already. Instead, I want to take you back to 2007, when Steve Jobs first launched the iPhone, and changed the world. I’ve watched the video of that keynote about three times today. It has caused me to think about what it tells us about Apple as a company, and our insatiable appetite to be on the bleeding-edge of technology. When describing Apple events, cliché most frequently toted out is “religious experience”. But as hackneyed and unoriginal as it is (and believe me, it is), it’s also true on a very fundamental level. In 2007, the church pews of the San Francisco MacWorld Expo were crammed with the faithful. Journalists, developers, and Apple devotees were sitting cheek-to-jowl to each other, squashed into the auditorium of Moscone Hall West. The audience was clearly enraptured with what they were seeing on Stage. Steve Jobs – the reverend, the master evangelist – was talking, and all eyes were on him. Jobs was unveiling something that had never been seen before. Certainly, other companies had smartphones, but Apple was going to be the company that defined it. 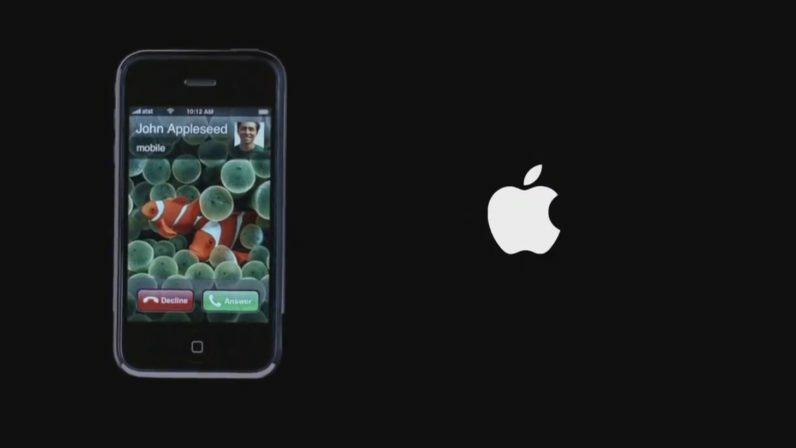 During my second run-through of the 2007 iPhone video, I caught myself audibly saying “wow“. A sleek and gorgeous phone that had a fully glass Multi-Touch display, and virtually no buttons? A full web browser that displayed websites in their full desktop glory – not just a crippled WAP one? HTML email, iTunes, and Google Mail? This was amazing. With each new feature, the audience whooped and hollered and cheered. These were their hallelujahs. What we saw in 2007 is now everywhere. To understand how significant and magical the first Apple keynote is, you have to look at it in the historical context. At the time, smartphones were clunky and awkward, and best suited to the workplace. You’d more likely see them in the hands of besuited, overworked businessmen rather than teenagers and college students. Apple made smartphones not merely practical, but cool. In the weeks that followed, iPhone fever swept the world almost like The Beatles did in the sixties. It was an obsession that afflicted almost everybody. Handsets were quickly swept up by an enthusiastic public, many of whom had queued for days to buy one. Many were being sold on eBay for many times the asking price. Someone who was demonstrating his phone outside the launch event for a morning breakfast show almost had his stolen on-camera. The unsuccessful thief ended up with a handful of the foam from the interviewer’s microphone. Such was the power of the iPhone. If you had to ask me what makes an Apple launch event special, I’d have to say that it’s like watching the future. It’s like peering into a crystal ball and seeing what the next few years of consumer technology will look like. The iPhone wasn’t just a visionary product that transformed Apple. It made BlackBerry, Palm, and Google (who at the time was developing Android in the mold of the current BlackBerry devices) fundamentally change their approach to this market. While later versions of the iPhone haven’t been as radical as the first, they’ve typically been great indicators of what other companies end up doing: from gold color options, fingerprint scanners, and front-facing cameras. Then, there’s the spectacle. Few other companies can build anticipation like Apple. This, perhaps unintentionally, is by design. Apple is a notably secretive company. This is Jobs’s legacy. He was porosity as a barrier to the incredible things he wanted to accomplish. Ironically, this has been an incredible marketing tool for Apple. A dearth of information breeds speculation, and speculation breeds anticipation and excitement. And I’m excited. There really is nothing like an Apple launch event. Bring on tonight. Follow our coverage of Apple’s iPhone 7 keynote and find the latest stories about it here.